Save with the latest Freshmenu coupon code for India - Verified Now! 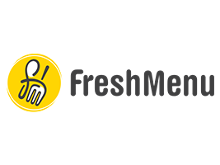 Freshmenu promo code: Get 30% off on Non Veg Main Course dishes! Add Freshmoney and get extra 23% discount on every order. Grab Rs.30 cashback with Paytm and BHIM UPI! Order for Rs.99 and more to avail the cashback! Getting lunch at work, or dinner when you are working late can be a challenge, especially when you work in areas where access to restaurants and stalls are limited. Freshmenu India believes in delivering good food. And with great food, comes great savings! Order with Freshmenu promo codes and enjoy amazing deals that help you save on your meals. Order yourself a full meal deal for as low as Rs.160, and get a burger or a nice meal and a drink along with it. Who would say no to delicious food, especially when it is delivered to you? Visit now! Do you ever get that feeling when you crave for something sweet right after you have your lunch or dinner? And you wish you had ordered a cake or a bowl of ice-cream along with your meal. Fret not, Freshmenu India is making sure that your cravings are satisfied. With our Freshmenu discount codes and with every order above Rs.400, get yourself a complimentary Choco Duet Mousse on the house! You wouldn't say no to chocolate, especially when it’s free.